Johnstown, Ohio, being located right outside the I-270 loop, is a city that Flowerama delivers to everyday of the week, including Sunday. Offering same day flower delivery and express flower delivery to the city makes Flowerama a top florist for the people who live work and visit. "Johnstown Blooms" is the signature arrangement for the city as selected by the design team at Flowerama. Winner of the Consumers Choice Award for the best flower shop, Flowerama is proud of the reputation it has earned. 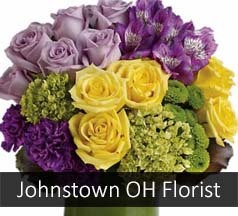 We provide daily flower delivery to Johnstown businesses, Johnstown nursing homes, Johnstown funeral homes and Johnstown Schools. Delivery to Johnstown is $14.95.